Aero brands use only the finest raw materials and are manufactured to international quality standards governed by ISO13485:2003 and never compromise performance for price advantage. 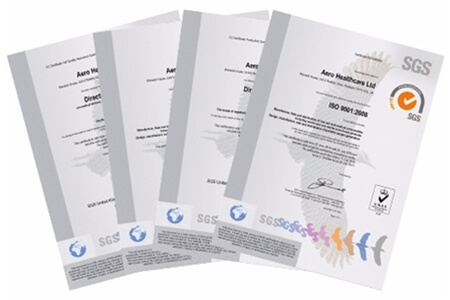 Relevant quality management systems such as ISO13485:2003 and 9001:2008 are operated in each country and products are CE marked for the European market and certified as meeting the requirements of the European Medical Devices Directive 93/42/EEC by SGS Ltd and the TGA in their position of Notified Bodies. Ongoing product development ensures optimum performance through strict control of raw materials and the use of new technologies to bring innovative solutions to first aid and wound care. Our emphasis is on increasing automation to ensure sustainable competitiveness and continual improvement. Aero Healthcare is committed to supporting the environmental and sustainability objectives of its clients and recognises the responsibility for achieving good environmental practice and operating in a sustainable and socially responsible manner. To this end we publish an Environmental Policy which is regularly reviewed to ensure we are reducing our impact on the environment and providing a sustainable business model and structure. Under this policy the use of all forms of resource are regularly reviewed. Consultants have been appointed to develop our Environmental Management System to full compliance with ISO 14001 and to achieve independent accreditation. Aero Healthcare is very sensitive to environmental issues that are necessarily associated with packaging materials and are constantly working with manufacturers and customers to find ways of minimising the impact on the environment. Suppliers are carefully vetted to ensure that regulations are strictly adhered to and products are chosen that ensure environmental impact is minimised without compromising the protection of the goods. Aero brand products use packaging containing recycled materials and is recyclable. Our corrugated cartons contain an average of 70% recycled content and the virgin pulp is obtained from professionally managed forests with more trees planted than are cut down. The manufacturers used by Aero Healthcare are leading the market in developing papers and boards that reduce the amount of virgin pulp used. Our delivery and transport arrangements are designed to minimise pollution and emission by use of efficient carrier networks. This minimises miles travelled per delivery made on a similar basis to car sharing. Companies are carefully vetted and those selected use vehicles which are updated on a three yearly cycle ensuring use of the latest technology and adherence to current emissions regulations. Maximum use of public transport is made when attending meetings outside the company’s offices. This is facilitated by excellent rail and other public transport connections from our base town Horsham in West Sussex. Be assured, in an environmentally conscious world as a company Aero Healthcare is leading the way in developing environmentally friendly and long term sustainable First Aid solutions. Aero Healthcare fully supports the need to ensure ethical and socially responsible procedures throughout all supply lines and accepts its responsibility to ensure that its own direct activities are conducted in an ethical and sociably responsible way and that it’s procurement as far as is in our control will only be conducted through and with suppliers and manufacturers who operate a similar and acceptable policy. Aero Healthcare guarantees that it uses no forced, bonded or involuntary prison labour, child labour or other unacceptable employment practises nor does it engage staff who are not legally permitted to obtain employment within the countries of its operations. Staff are not required to lodge “deposits” or identity papers and are free to leave our employ after reasonable notice. Furthermore Aero Healthcare will support the initiatives of the governments under which it operates in such matters as minimum wages, working conditions, diversity and equality legislation or regulation. Working hours comply with UK national hours and are not excessive. Physical abuse or discipline, the threat of physical abuse, any form of harassment or other forms of intimidation are not permitted. The health, safety and welfare of employees and visitors to our operations is of paramount importance and Aero Healthcare will therefore meet and endeavour to exceed the legislations and regulations of the countries within which is operates. In order to extend our influence in these important areas Aero Healthcare will undertakes to vet current and potential suppliers for compliance with its own policies as stated above and will choose as suppliers and manufacturers those companies and organisations which demonstrate the closest match to our own ideals. Where any evidence of positive abuse of the ethical and social principles espoused by Aero Healthcare comes to our attention suppliers will be initially given opportunity to address these issues within an agreed and acceptable time frame. Where such compliance is not forthcoming in an acceptable and agreed time scale business with such companies will be terminated.